Clubmoss (common word to refer to the Lycopodium/Huperzeria genera of plants) is a collection of plants with traditional usage in promoting memory formation, and appears to have a large collection of unique alkaloids. Its main bioactive is Huperzine-A. Our evidence-based analysis on clubmoss features 16 unique references to scientific papers. The Lycopodium genus (of the family Lycopodiaceae) is a genus of herbs more commonly known as Clubmoss or Toothed Clubmoss, the genus (Lycopodium) is synonymous with Huperzeria in reference to the main bioactive of clubmoss being Huperzine-A (also known as shuangyiping); other less common synonyms for this plant include Devil's Ash, Devil's Claw, or Ground Pine. The related herb Lycopodium serratum appears to be a traditional chinese medicine for memory and the overall genus includes the species of serratum or serrata, alpinum, annotinum, clavatum, complanatum subspecies chamaecyparissus, obscurum, and selago. Complanadine structures from lycopodium complanatum have been found to induce mRNA for NGF at a concentration of 100μM by 3.9 (complanadine A), 2.3 (complanadine B), 2.4 (complanadine D), and 2.8-fold (complanadine E). This has been reported previously with complanadines C and D.
A study using fractions of Lycopodium clavatum in a mouse model of acetic-acid induced capillary permeability increases, it was found that the most active fragment (500mg/kg chloroform extract causing 32.1% inhibition) was less potent than the reference drug of indomethacin at 10mg/kg (44.6% inhibition). This fraction was mostly (84.5%) lycopodine. Lycopodium clavatum appears to have traditional usage in Turkey for wound healing properties and has usage for burn healing as well. ^ Traditional Chinese medicines and new drug development. ^ Some new Lycopodium alkaloids. ^ New phlegmarane-type, cernuane-type, and quinolizidine alkaloids from two species of Lycopodium. 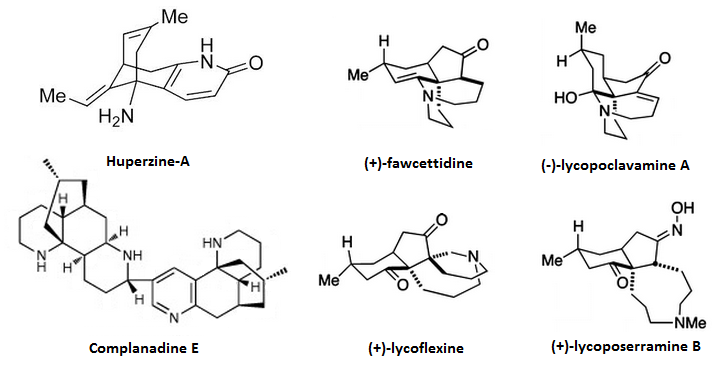 ^ a b Ten new fawcettimine-related alkaloids from three species of Lycopodium. ^ Total Synthesis of (+)-Complanadine A Using an Iridium-Catalyzed Pyridine C-H Functionalization. ^ Complanadine B, obscurumines A and B, new alkaloids from two species of Lycopodium. ^ A HPTLC method for the identification of ferulic acid from Lycopodium clavatum. ^ A preliminary survey of traditional medicinal plants in the west coast and interior of Saba.